Where have all the guys gone? It seems these days the Ladies are the competitive ones. Where have all the guys gone? 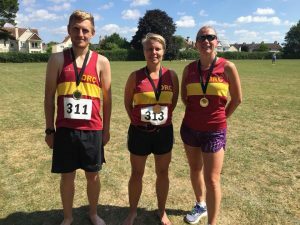 Four intrepid Ladies from Okehampton Running club took to an impressive challenge that turned into a dramatic race due entirely to the break in the wonderful sunny weather. With course changes at the start and during the races. 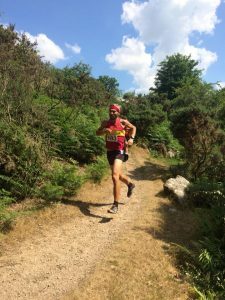 The Something Wild Trail Running Festival is a family friendly trail running event at Dartmoor National Park. It takes place at Huccaby Farm, nestled in a secluded valley and surrounded by the fabulous landscape of Dartmoor. 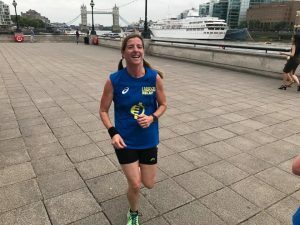 Gill Spinney gave a great performance in her longest run yet by attempting the Marathon distance, then Jo Page, Christine Fritsch and Mags Jarvis completed the half- marathon. Both courses include tough climbs, enjoyable downhills and, of course, Dartmoor’s best trails and views. The trail marathon was the blue ribband event. Starting and finishing at the festival site at Huccaby, it crosses the fulcrum of Dartmoor where east and west rivers meet at Dartmeet and completes a circuit of Bellever woods via Yartor, Babeny and Sherwell Farm. It then heads east along Dr Blackalls Drive, crossing the river for a second time at New Bridge following a bone jarring descent and heading in to Holne Woods, then on in to Hembury Woods, skirting the brook before ascending the steep climb up Pupers Hill via Scorriton, a long, gradual descent to Coombestone Tor and the final crossing of the river at the Huccaby stepping stones, before reaching the sanctuary and bustle of the festival site. This route was changed during the race to one 8 mile loop and 3 of the 10k loops. Gill had to stop the river crossing on her second 10k loop as the water was chest deep and running very fast making the crossing particularly hazardous. Gills race was shortened to about 21 miles and finished safely at the festival site. 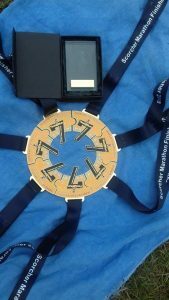 The original half marathon route started and ended at the festival site at Huccaby Farm, crossing the river at Dartmeet before climbing gradually to Sharp tor and along Dr Blackalls Drive to New Bridge, and on to Holne Woods. Crossing through Holne and return via Holne ridge to Coombestone tor. However due to the weather they had to change the route to two loops of their 10k route for the half marathon. This still involved crossing some stepping stones across a river. The ORCs had to wade through the river as it was assessed as being safer than jumping across the slippery rocks although up to their waste deep in water, the water rising on every minute that passed. On the second loop the race team had closed the river crossing and changing the route during the race and had to turn back the way they came. In the end the final finishing course was about 12.5 miles. Jo Page was 1st female overall. Mags first FV60. All came in safely within 3 hours. A fellow ORC, Mike Westland on a family trip to London competed in the Lee Valley Velo Park series 10k race. On this moto GP styled race circuit, Mike stormed his way to a fun and frantic attempt at his personal best. The race is set in Lee Valley’s Velo Park, a normal home for BMX cycling, this was the first opportunity to run the route on this spectacular one mile circuit at Olympic Park. Mike came in with an impressive 52:14mins which was 35th out of 125 runners and second in the FV60 category. Two other lady ORCs took to a races of a different kind, they took part in Runners Against Rubbish. Each running team ran a specified part of the South West coast path and collected as much litter as possible. During this weekend the whole of the South West coast path was being run by groups doing the same. 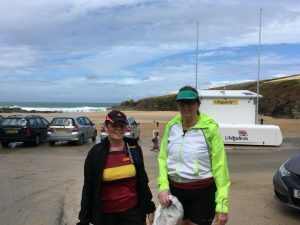 Carole Cornwall and Katy Speak ran from Padstow to Porthcothan, a distance of about 13miles. No medal or time but the satisfaction that they collected two bins bags full of rubbish. And finally, Jo Page and Hayden Bond tried out short but fun annual race at the Chulmleigh village fair. A short 2 mile race with hills and Jo finished first lady with Hayden coming in second overall. The long and the short of it all! 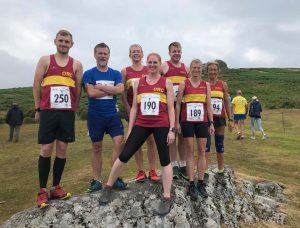 In an exciting week of racing there were some great results by Okehampton running club members across a broad spectrum of race types and distances. Wednesday evening saw eight ORCs travel to Exeter to try and set some fast times at the Exeter 10k. Starting and finishing near Haven Banks the course was two laps of the Riverside Valley Park where light cloud and no wind made for ideal running conditions. First home for the club was Graham Bryant, whose time of 39.27 was a new PB and the first sub-40minute 10k by him. He was followed by Ed Dumpleton, also setting a new PB of 41.23, going under 42 mins for the first time. Next was Hayden Bond in 41.36, followed by a duo of ORC ladies who both produced superb runs with Karen Vallance just holding off the fast improving Jo Bradford to beat her by four seconds. Their times of 47.25 and 47.29 respectively saw Karen set a new club age group record which has stood for eight years. Jo’s time had equalled this record and had set her a new PB by 1min 38sec. Mags Jarvis’ time of 51.23 was equally impressive, giving her the highest age graded percentage she’s had and a platinum award. She was followed by Ged Fitzgibbon in 53.18 and Phil Turner, who replaced his wife Jo due to a last minute injury and set himself a new PB of 57.54. 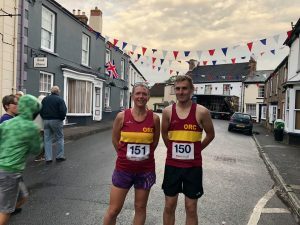 The following evening the Tavy Town Relays took place in Tavistock with Okehampton fielding teams in the Senior men’s, Vet men’s and Vet women’s categories. These well established 1.1mile lap relays with teams of 4 runners are fiercely contested for club honours, with supporters and fellow runners making for an exciting and electric atmosphere throughout the course. The ladies were the first to race with two vet teams running and they rose to the occasion, particularly Sarah Marvin who ran first leg in one team and then stood in for the injured Jo Turner to run the anchor leg in the other team. She and her fellow runners Karen King, Karen Vallance and Jo Bradford were rewarded with second place in the vet category. This set the benchmark for the men’s races where two vet and one senior men’s teams took part, and also a mixed team of men and ladies. The men again put in some great runs, with competition even between the fellow ORC teams, but the men’s A team of Rob Kelly, Paul Carter, Andy Vallance and Andrew Vernon were strong and finished in second place ahead of the fourth placed B team. The other ORC teams were; Mens Vet B; Hugh Robinson, Alec Robinson, Ed Dumpleton, with Hugh running a second time for the absent Steve Gentle (4th). Ladies Vet B; Anne Binns, Jane Jackson, Kathryn Volkelt-Igoe, Sarah Marvin (8th). Men’s senior; Graham Bryant, Hayden Bond, Tom Andrew, George Haskell (10th). Mixed; John Binns, Louisa Jayne, Jaqueline Rice, Mike Westland (19th). Two days later eight ORCs were out running a completely different type of race, the iconic Haytor Heller. This notoriously tough and hilly moorland race, starting and finishing in the shadow of the great Haytor rocks, has a cruelly steep uphill start but a wonderful downhill finish for those brave enough to hurl down to the finish line. Christine Fristch and Rob Hicks had completed this race before but for the others this was a new experience, turning out to be successful and enjoyed by all. Rob was happy to have a good run round while not racing too hard having recently come back from injury, but still came 7th overall and first M35 in a time of 44.33. Emma Dean has been running really strongly in her recent races and her time of 1.03.41 rewarded her with 2nd F35 here. Jane Jackson was running her first off road race since her ultra marathon two weeks ago and was pleased to win the FV60 category in 1.11.24. Together with Jo Page and Christine Fritsch these four were placed third ladies team. Other ORC times; Hayden Bond; 56.14, Jo Page; 58.05, Tom Andrew; 1.01.36, Jason Ewing;1.03.42, Christine Fritsch; 1.09.39, beating her previous course time. 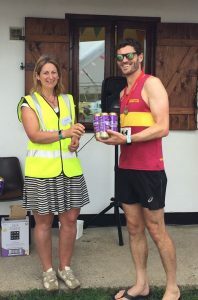 Perhaps the outstanding performance of the week was Roger Voaden’s participation in the Salwick Scorcher 7 in 7, a series of seven marathons in seven days, held near Preston in Lancashire. These races were all following the same five mile loop repeatedly throughout every race, so called for both physical and mental strength and even a marathon specialist like Roger found them tough going, particularly in hot conditions. Roger’s times for the marathons were; 3hr 20 (1st), 3hr.28 (1st), 3hr 58 (2nd), 4hr 46, 4hr 07, 3hr 50 and 4hr 25. Another unusual event that has seen three ORCs participate in recently is the I Move London Record Relay attempt taking part in the city throughout July. The aim is to set a new official Guinness World Record for the longest continual relay while at the same time supporting three charities who help combat homelessness, mental illness stigma and help reduce gang violence. Running throughout the day and night, the 4,000 miles will be completed by 2,500 runners over 5k and 10k laps where the baton must never be put down. 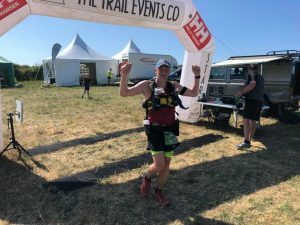 Jo Page and Hugh Robinson have completed stages earlier this month while Jo Bradford finished off a very successful week of races with her leg on Sunday. Jo Bradford gets the medal for being in 3 events and 3 photos in the same weekly report. Jo Page now has finally got some competition! Finally, its not often you get to run against a form Olympic Champion Dame Kelly Holmes, Okehampton’s leading Park runner, Jane Richardson, will never forget this weeks Exeter parkrun where Dame Kelly Holmes joined the runners. Despite claiming to not run much nowadays Dame Kelly finished first female and 7th overall and was an inspiring presence there, Jane feeling honoured to finish on the same results sheet as her, even with hundreds of other runners. Many thanks as always to Jane Jackson for your sometimes investigative journalism and Robert Richards for the easy task of publishing. 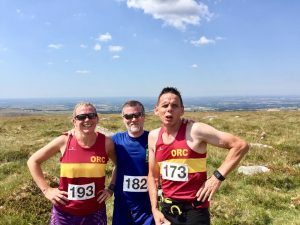 Another hot weekend saw more Okehampton Running Club members brave the high temperatures and take part in races from 4 miles to ultra marathon distance. On Saturday there was a good turnout of ORCs at the Lydford Dash, a 4.5 mile race over undulating ground incorporating fields, rough tracks, two river crossings with stepping stones and a bridge, and then across a beautiful common incorporating some of the best views of the moors and the village of Lydford beyond. First home for the club was Rob Hicks, getting back to some form after a long injury lay-off, with fellow ORC Hugh Robinson behind him claiming the 1st MV40 prize. First club lady was Jo Page, to be third lady overall. ORC times; Rob Hicks; 30.45, Hugh Robinson; 32.42, Andrew Vernon; 34.20, Jo Page; 39.16, Tom Andrew; 42.21, Christine Fritsch; 47.45, Janet White; 60.34. 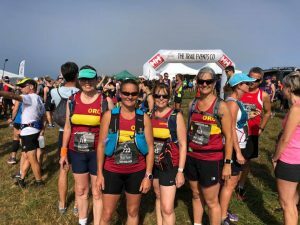 At the other end of the distance spectrum on Saturday, Okehampton was represented by four lady runners in the Lulworth Cove half marathon and a single male in the 34 mile ultra marathon. These races had been the victim of the late snow in March, but at the re-scheduled race the runners would have been glad of something cooler in the baking heat of this recent spell. The course takes the runners west from Lulworth Cove on the coastpath, past the iconic Durdle Door, and on nearly into Weymouth, where they turn inland and back to Lulworth. Here the half marathoners finish, while the marathon and ultra runners then head east on the coast path towards St Albans Head and Poole, turning off and heading back at different points. Despite the steep hills, the stunning scenery along this beautiful stretch of the South West Coastpath, made the huge effort on such a hot day worthwhile. First home in the Half Marathon was Gill Spinney in 2.37.33, after having to drop down from the marathon due to injury. Katy Speak, Carole Cornwall and Ruth Bushell all ran together, finishing in 3.20.26, with Ruth completing her first trail half marathon. Robert Richards completed his first Ultra Marathon in 8.36.47, relieved to put his previous attempt, when he had to retire feeling unwell, behind him. Sunday was no cooler for the three ORC’s running the Care for Kids Barnstaple 10k. The race starts at Park school on the sports field, and then meanders around the historic Rock Park before it continues along Taw Vale and the Strand using the Tarka Trail and over the Taw Bridge, which is the steepest part of the course. It then returns back to the town square along the riverside and into Rock Park, finishing at Park School. The course is a flat, fast one, perfect for a first race as well as an ideal opportunity to gain a personal best. Hayden Bond was the first home for the club in 42.45. Not content with just one race this weekend, Jo Page raced again here, finishing second lady overall and first senior lady in 45.04 while Karen King found it tough in the heat but ran well to finish in 49.43, coming third in her age category. One ORC did manage to find some water to incorporate into his race when Paul Jelley competed in the Honiton sprint Triathlon. Here the competitors swam 16 lengths (400m) in a pool, before a 20k bike ride and a 5k multi-terrain run. Paul completed in 1.22.24, coming 6th overall and 1st in his age category in what was his third triathlon. Thanks to Jane Jackson (welcome back) for reporting and Robert Richards for posting. It was the Belstone Village Fair this weekend, Okehampton Running Club organise this traditional race which has been going for many years. The race started in the village green as part of the fair celebrations approximately 3.2 miles with a climb of around 300m over rough open terrain to the top of Cosden Hill and back. 35 keen runners set off in 29 degree heat at the Cosdon Hill race. Spectators were treated to a fierce battle for first place with an elite group all running close to the course record of 29m06s. 2017 winner and ORC Rob Hicks flew down the hill leading a group of three down the path into the valley with 2015 winner Tim Lenton hot on his heels as they were lost from the view from Belstone common. When they re-appeared on the path up to the green Tim had taken the lead and both men turned themselves inside out battling to be the first to the line, with Tim triumphing in 29m22s and Rob coming through just 5 seconds later. Paul Crease was the next ORC back, winning the MV40 and taking 5th overall in a time of 33:36. In the Female division Jo Page (who had turned up to marshal only to find we had plenty of help) continued her impressive form by winning in 49:09. Ruth Bushell took the FV50 in 1h2m28s and Janet White ran strong to the finish taking the FV60 category in 1h4m24s. 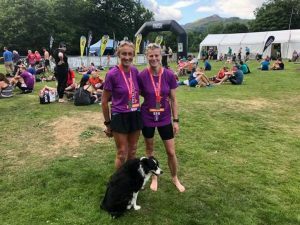 Further afield in the Lake District was two of our most respected lady trail runners, Jane Jackson and Christine Frisch completed their Ultra Marathon. They raced the 55km Ultimate Trails Challenge which is a testing 55km ultra marathon course through some of the most dramatic mountain scenery in the Lake District. The tough, challenging course will certainly live up to its billing as the most picturesque ultra-marathon in the UK. The 55km route also includes 3 mountain passes, with 7,000ft ascent/descent along with 5 memorable feed stations. Starting and finishing in Ambleside, the 55km Ultimate Trails Challenge takes in a complete circuit of the central Lake District, along well marked and marshalled footpaths and bridleways. 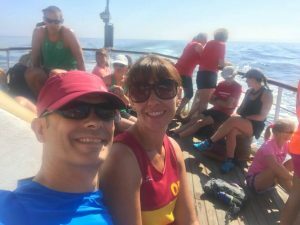 Lastly this weekend another of Okehampton Running Club seasoned lady Trail runner Jo-Anne Turner took her husband Phil Turner on a boat trip to the Island of Lundy to run the first long half marathon around this beautiful island. Lundy Race the most unique Trail running experience is Fourteen (ish) miles of pristine, wildlife encrusted tracks tended by the Landmark Trust are open for us to run, walk and crawl. Whichever way you do it, you will visit all 3 lighthouses traversing the undulating eastern and western clifftops, cling to the precipitous slopes and run along the central spine of the island (as well as a few side tracks). You will definitely discover this beautiful and rugged island in all its glorious entirety, on foot and at your own pace. Jo-Anne complete in 3:12.55 with Phil behind in 3:12.56. Thanks you to Robert Richards, Hugh Robinson and Mags Jarvis for compiling the material. After a very busy few weeks for Okehampton Running Club last weekend was not a busy one for races. 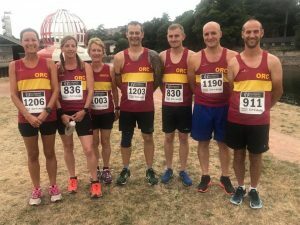 The club, along with OCRA, organised the Run in the Park on Sunday 1st July and runners enjoyed a cooler and rather damp 2.5K or 5K run (two laps) in Simmons Park. Many members of the club were also off training locally for various upcoming races and generally trying to stay cool! Jo Page took on another new challenge to add to her achievements of different races in many different venues. She took part in a very unusual race on Thursday June 28th called “Steaming Down the Valley”, where she raced a steam train. This was held in Shropshire at the Severn Valley Country Park and ended at Arley Station racing against a full on Steam Train (called Bradley Manor) from the Severn Valley Railway. This was the first year this race has been run. Jo didn’t manage to beat the steam train but she really enjoyed a fantastic race and won the trophy for being the 2nd female finisher and was 24th overall. The race was on trails and was about 3.5 fairly challenging miles. Well done Jo. Error: Error validating access token: Session has expired on Saturday, 20-Apr-19 03:20:42 PDT. The current time is Monday, 22-Apr-19 11:19:03 PDT.